Picking up where 1x06 - Heart Monitor left off, Scott and Stiles are hiding from the alpha inside the school. Scott yells at Stiles to find a way to lock the metal doors, and Stiles remembers the bolt cutters he dropped outside. Despite Scott's better judgment, Stiles goes back out to get them. As he's picking them up, the alpha comes around the back of the Jeep. Scott yells in warning, and Stiles runs back inside, jamming the bolt cutters into the door mechanism. The alpha is suddenly gone, and the boys back away. They hear the alpha howl and take off into the school, looking for a better place to hide. They start to block a classroom door with a desk, but Stiles points out that a door isn't going to keep it away. Stiles then agrees with Derek's assessment that Deaton is the "murdering psycho werewolf," and accuses Deaton of just having killed Derek as well. Scott doesn't believe it. He asks Stiles what they should do, and Stiles suggests running to the Jeep. "And you seriously think about quitting your job. Good?" They try the windows, but the windows don't open because the school is climate controlled. Breaking one would attract the alpha's attention. Scott's only other plan is running really fast, until he notices that the hood of the Jeep is smashed in. As they try to figure out what that means, the battery from the Jeep comes flying through the window. Stiles thinks they need to run, but Scott insists on taking a look first. The coast is clear, so they creep back out into the hallway. Stiles suggests they find a room with fewer windows, and Scott suggests the boys locker room. He tells Stiles to call his dad, thinking that a parking lot full of cop cars will scare the alpha off. Stiles is concerned that if he does that the alpha will kill all the cops, including his dad. It took a wolfsbane bullet to slow Derek down, so he figures regular bullets won't do much to the alpha but piss it off. Running is still the only idea Scott has. Stiles points out that the school is about a mile from anything useful, so Scott suggests taking Derek's car. Stiles thinks that could work. They can take the keys off his body and go. Scott adds that they'll take Derek's body with them, although Stiles is nonplussed about the idea. They're about to head back out when Scott pulls Stiles to a stop because he heard something. They decide to hide in lockers, even though Scott thinks that's stupid. A janitor nearly has a heart attack when he finds them in there, and he forces them both out. Just as he's throwing them out of the locker room, he's grabbed by the alpha. Scott tries to go back in to help him, but Stiles grabs him and forces him to run instead. Meanwhile, Allison is waiting in the driveway for Scott. Jackson calls and tells her they're coming to get her, because Scott is 26 minutes late. They pull up and insist she get in the car. Allison then gets a message, which isn't an apology from Scott. Stiles and Scott run for a set of doors at the end of the hallway. They try to bust through, but there's a Dumpster on the other side holding the doors closed. Stiles shoves at the door in desperation and announces that he's not dying at school, of all places. Scott makes him stop, although why he doesn't use his super strength to push open the door is anyone's guess. Stiles asks what the alpha wants, and Scott tells him that it wants a pack. 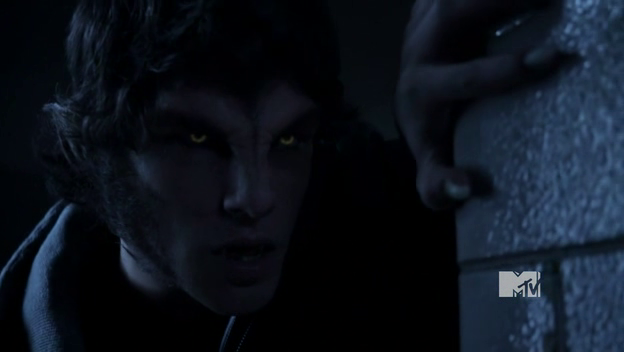 "Oh, great, a psychotic werewolf who's into teamwork. That's beautiful," Stiles replies. They stop and spot the alpha on the roof of the school through the hallway windows. It leaps down after them, and they run. They turn into the stairwell and fly down the steps to the first floor. Jackson, Lydia, and Allison show up at the school, because the text Allison got was supposedly from Scott telling her to meet him there. The text is dated Feb 7 at 7:12pm. Although somehow it took them 2 hours to get to the school, because it's 9:26pm when they arrive. Allison notes that one of the doors is open, propped open by the bolt cutters. She heads for it, and Jackson offers to come with her. She turns him down, and he almost says "Be careful," much to her amusement. She likes him looking genuinely concerned. It's a little flirty, and Lydia just watches them, fuming. Scott and Stiles run into a basement full of old lockers, with the alpha close on their tails. It doesn't quite seem to know where they are, and Scott motions for Stiles to run. Stiles decides that they need to do more than just run. They spot a lockable room, and he decides that they're going to try to trap it. He pulls out his keys and tosses them into the room. When the alpha goes for it, he slams the door shut, and they try to block it with a desk. It seems to have worked, and the boys smile at their cleverness. Outside, Lydia and Jackson wait in the car without talking. They're facing Stiles's Jeep, and Jackson notices that the hood looks crappier than usual. He goes to take a look, and Lydia insists on going with him. There are claw marks on the hood. Jackson is more disturbed by this than Lydia and starts backing away toward the school. Now that the alpha is trapped, Stiles decides he wants to get a better look at it. Scott's pretty sure this is the worst idea Stiles has ever had, but he doesn't stop him. Stiles tries to get a look and tells the alpha that he's not scared of him. He doesn't have to be scared because it's trapped. But as he's talking, the alpha rips through the ceiling and escapes. The boys take off running again. Allison walks through the dark hallways calling Scott's name. Jackson and Lydia enter the school, and Lydia announces that she has to use the bathroom. Jackson tells her that he's starting to get tired of her and her annoying habits. As soon as she's gone, Jackson turns to see a form looming in the hallway. He thinks it's Scott at first, then he's afraid that it's Derek. But it's actually the alpha. He starts huffing in panic and touches the wounds on his neck. Lydia returns, and Jackson tells her he hasn't found the others. Allison ends up at the pool. While she's there, she gets a call from Jackson and Lydia. Scott is able to hear her ringer and knows that she's at the school. Scott calls her and asks her where she is. She tells him she's at the pools, and he tells her to go to the lobby immediately. Allison, Scott, and Stiles meet up, and Scott wants to know what she's doing there. She shows him the text where he supposedly asked her to be there. He tells her he didn't send it, and she tells him that Jackson and Lydia are there also. Jackson and Lydia meet them in the lobby, and the alpha comes crashing down through the ceiling. They all run. They go into the cafeteria, and Scott locks the door at the top and bottom. Scott starts moving things in front of the door, while Stiles tries to tell everyone to stop. They ignore him and keep stacking everything in front of the door in orderly fashion. When he finally yells loudly enough that they listen, he asks them what they should do about the 20-foot wall of windows. They all stare, dumbfounded. Allison asks Scott what's going on and what that thing was. Scott just moves away from her and doesn't say anything. Stiles takes over and tells them that someone killed the janitor. Everyone starts to freak out then. Lydia says that it was supposed to be over because the mountain lion is dead. Jackson says that it was never a mountain lion to begin with, and Allison demands to know what the killer wants. She asks who it is, and in desperation, Scott tells them it's Derek. Scott keeps going with this story, telling everyone that Derek has been killing people around town. If they don't escape, he's going to kill them, too. Jackson suggests calling the cops, but Stiles tells him no, arguing that they don't know what he's armed with. "Your dad is armed with an entire Sheriff's department. Call him!" Jackson argues reasonably. Lydia calls 911, but the operator hangs up on her. They got a tip that there would be prank calls about a break-in at the high school. If she calls again, they'll trace the call and arrest her. Allison tells her to call again, but Stiles explains that they won't trace a cell and will instead go to Lydia's house before coming to the school. Allison wants to know why Derek would be killing anyone, and everyone looks at Scott for an answer. Scott gets extra defensive, and Stiles pulls him aside to calm things down. He congratulates him on throwing Derek under the bus in a not entirely approving way, and Scott figured that if Derek was dead he wouldn't mind. What Scott can't figure out is why the alpha is cornering them rather than killing them. 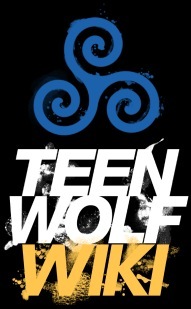 Derek told him that the alpha wants revenge, so maybe it was about getting Allison to the school to kill her. Jackson breaks up their pow-wow and suggests that Stiles call his dad and tell him to send someone with a gun and decent aim. Stiles won't drag his dad into this, and Jackson goes after Stiles to steal his phone. Stiles punches him in the face. Allison goes to see if Jackson is okay, and Stiles gives in. He calls his dad and gets voicemail. He leaves a message just as the alpha starts trying to bust in the door. As they all watch the door rattling to pieces, Stiles says that the door from the kitchen leads to the stairwell. "Which only goes up!" Scott says. "Up is better than here," Stiles replies. They all run, and the alpha busts the door down. On the second floor, they hide in the Chemistry lab. Scott amusingly places a very small stool under the door to keep it closed. For some reason, the alpha passes by the lab, despite all the racing heartbeats inside. Scott asks Jackson how many people his car can hold. Jackson tells him 5, which Allison seriously doubts because she barely fit in the back alone. Scott then suggests they use the stairs from the lab to the roof and climb down the fire escape. The door, however, is deadbolted. The janitor has a key, but it means going back to the basement to find his body. Scott says that he's going to go get the key. Allison tells him that he can't go out there unarmed, and Lydia points out that she can make a self-igniting molotov cocktail from the chemicals in the lab. Everyone gives her a stunned look, and she tries to play innocent. Jackson smashes open the cabinet, and Lydia gets to mixing. She asks Jackson for the sulphuric acid, but he's not sure which bottle it is and just hands her one. Scott takes the flask, but Allison tries to tell him that he can't go. She explains that he has a tell and she knows he's been lying all night. Jackson smirks. Allison begs Scott not to go, but he tells Stiles to lock the door behind him. Allison kisses him goodbye. Scott heads down the stairs to the first floor and follows the scent of blood to the gym. He finds the janitor's body strung up under the bleachers. Allison doesn't understand why Scott went out there. She can't stop her hands from shaking, and Jackson tries to comfort her. He smirks a little when she accepts his kindness, because it means she's coming under his influence. Scott puts down the molotov cocktail and climbs the bleachers to get the keys. As he does, the alpha starts closing the bleachers up, trying to crush him inside. Scott escapes. Lydia asks Jackson if he gave her the sulphuric acid, because the cocktail won't ignite without it. He hisses that he gave her what she asked for. But Stiles and Lydia seem to know that he didn't. The alpha approaches Scott in the gym. He throws the molotov, but it doesn't ignite. Instead, the alpha grabs Scott and slides him across the floor. It pins him down and roars. The sound shakes the building, and Jackson collapses from pain in his claw wounds. Both Jackson and Scott writhe on the floor, as the alpha forces Scott to shift. The others pull Jackson up from the floor, but he insists that he's okay. He bats Stiles's hand away when he tries to get a look at the wounds. Scott walks back toward the Chemistry lab under the alpha's thrall. He puts the key in the door, which no one hears, but he stops when he hears Allison ask where he is. Memories of her flood through him, and he breaks the key off in the door to keep himself from getting in. Allison starts freaking out, but Lydia tell her to stop and listen. She can hear sirens. When they look out the window, Derek's car is gone. The Sheriff and one other cruiser pull up. Scott is out in the hallway trying to shift back. Scott and Stiles confirm to the Sheriff that it was Derek they saw. Scott asks about the janitor, but the Sheriff insists that they checked under the bleachers and didn't find him. Scott knows the Sheriff doesn't believe him, but the Sheriff tells him that they will keep looking. Stiles is glad that they're alive, but Scott tells him that they didn't accomplish anything. The alpha knew they were in the Chemistry lab and walked right by. Scott tells him that the alpha wants him in his pack but first he has to get rid of his old pack: Allison, Jackson, Lydia, and Stiles. "And that's not even the worst part." "How in holy hell is that not the worst part, Scott?" "Because when he made me shift, I wanted to do it." Stiles is struck silent. Then Scott notices Alan Deaton in the back of an ambulance. He asks how he got out. "Not easily." And then he offers Scott a raise. Scott catches up with Allison and asks if she's okay. She's trying to not cry as she tells him that she doesn't understand why he did such a crazy thing. She doesn't feel like she can trust him. He tries to make excuses, but she tells him not to call and walks away.